Pyroclastic cones are the most abundant of volcanic structures. These small cones, named from a combination of the Greek words for fire (pyro) and broken (klastos), are built of fragmental material. They are found both as subsidiary features on larger stratovolcanoes and shield volcanoes or as independent volcanic structures. Pyroclastic cones typically range from a few tens of meters to a few hundred meters in height and are most often formed during single eruptions, when explosively ejected material accumulates around the vent. The slopes of pyroclastic cones consequently approach the angle of repose of its constituent materials. Pyroclastic cones, also known as cinder cones or scoria cones, can form rapidly, but remain active for long periods of time. 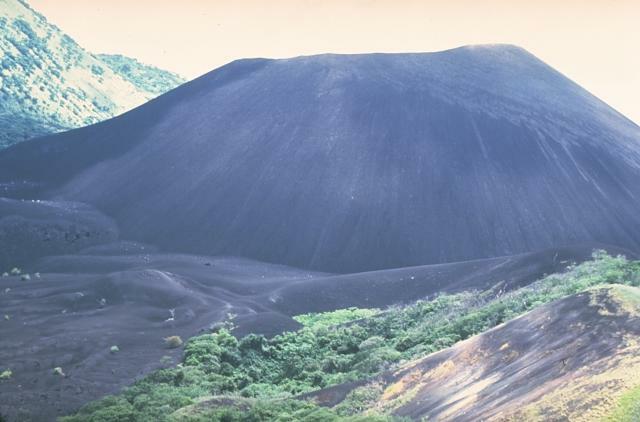 Parícutin, the famous volcano born in Mexican cornfield in 1943, reached 80% of its 424 m height during its first year, but remained active for 9 years. Tuff cones are a variety of pyroclastic cone formed by more energetic explosions involving groundwater that extensively fragment ejecta, producing finer-grained ash deposits; they typically have steeper slopes and wider craters than cinder cones. 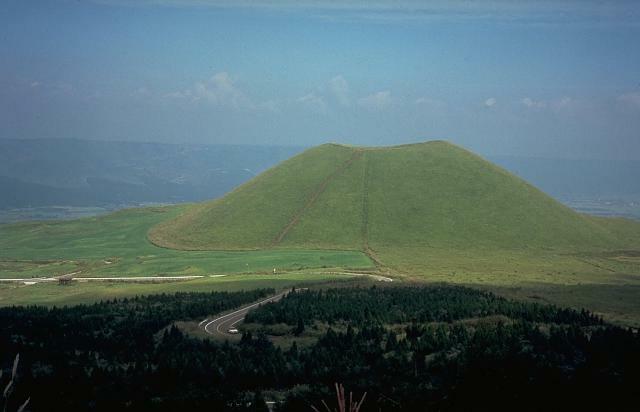 Kometsuka scoria cone, on the NW side of the central cone complex of Aso volcano on the island of Kyushu, was constructed about 1800 years ago. Explosive eruptions building the cinder cone were accompanied by lava flows that traveled down the flank of this complex of stratovolcanoes in the center of Aso caldera. A broad moat separates the central cone complex from the caldera walls, which form the horizon. 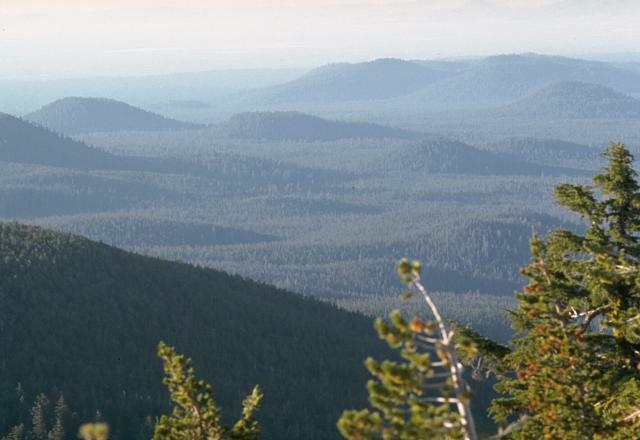 Some the more than 400 cinder cones that dot the flanks of the massive 30 x 60 km wide Newberry shield volcano in Oregon are seen in this view from Paulina Peak on the south rim of Newberry caldera. 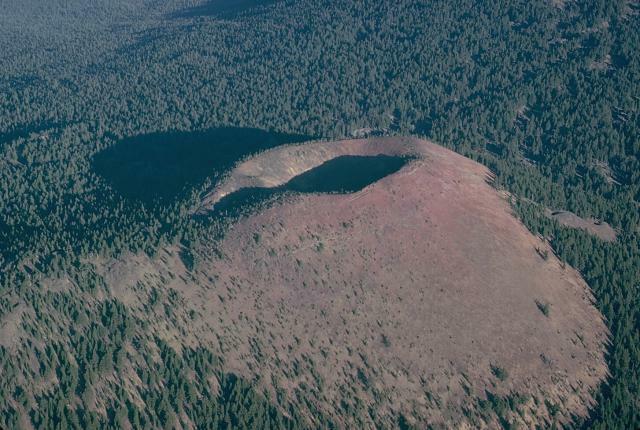 The cinder cones at Newberry are most abundant on the north and south flanks. Many are of Pleistocene age, but cinder cones along a rift on the NW flank and some on the south flank have erupted during the Holocene. 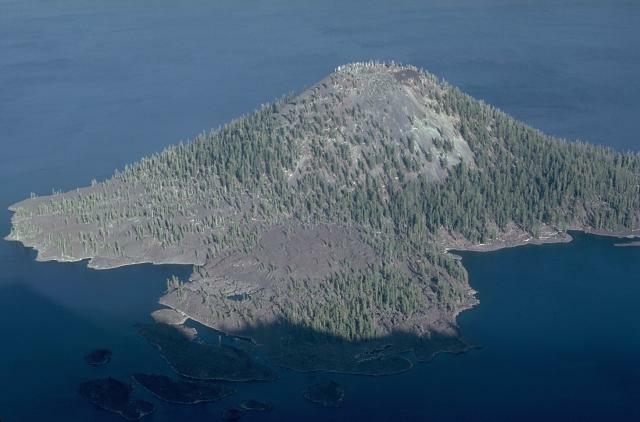 Wizard Island cinder cone, with a symmetrical 90-m-wide crater at its summit, formed above the west floor of Oregon's Crater Lake caldera within a few hundred years of caldera formation. A lava flow created the peninsula in the foreground on the NW side of the cone, which forms a small island on the west side of Crater Lake. A submerged dome, 30 m beneath the surface 1 km east of Wizard Island, is the youngest feature of Crater Lake caldera. 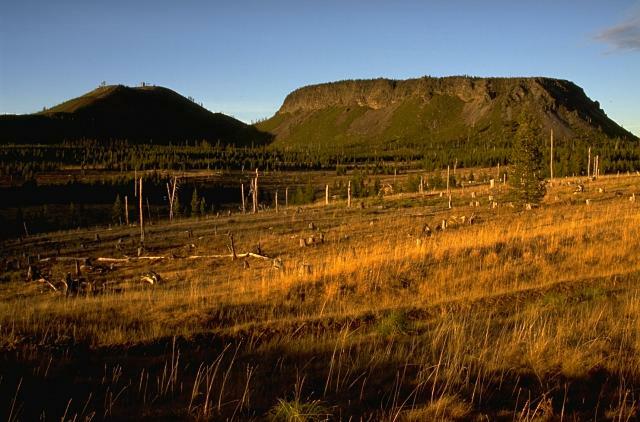 The contrasting morphology of rounded Hayrick Butte on the left and flat-topped Hoodoo Butte on the right, north of Mount Washington in the central Oregon Cascades, reflects dramatic differences in their origin. Hoodoo Butte is a "tuya," a volcanic cone formed by eruptions that ponded in a cavity melted through a glacial icesheet. 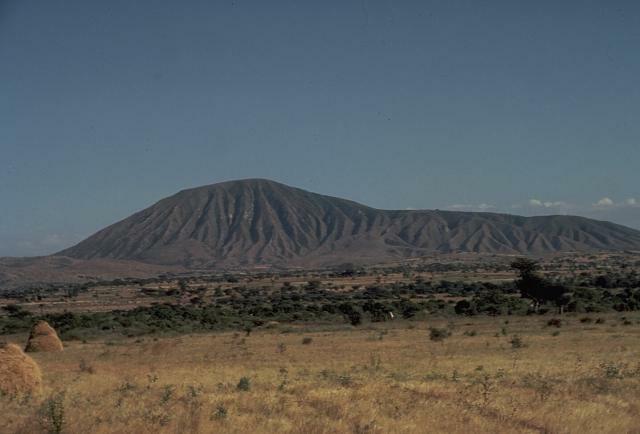 Hayrick Butte formed slightly later, when the Pleistocene icesheet had melted, and formed the classic rounded profile of a cinder cone. Cerro Colorado tuff cone is one of the most prominent features of the Pinacate volcanic field. 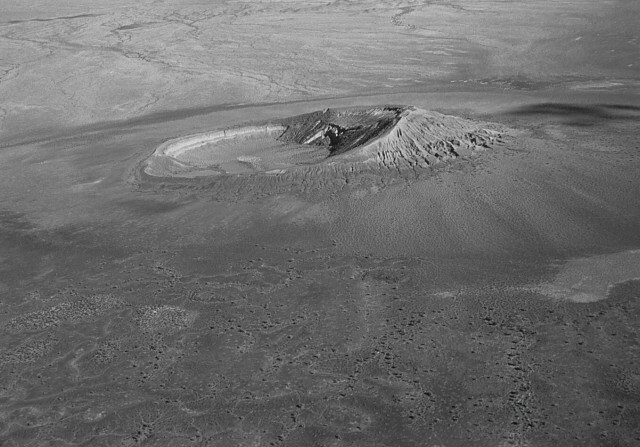 This aerial oblique view from the NW shows the 1-km-wide crater with its high point on the south rim. Tuff beds at Cerro Colorado dip inward up to 20-25 degrees at the south rim, much more steeply than at the low-rimmed Cráter Elegante. Cerro Colorado's crater was formed during several episodes of phreatomagmatic eruptions from multiple vents, during which portions of the tuff cone slumped into the crater. Photo by David Roddy, 1965 (U.S. Geological Survey). 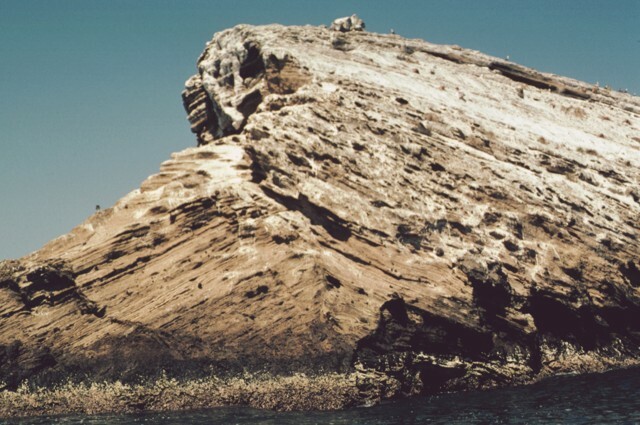 A sea-cliff exposure at the southern end of Islota Pelón, located off the NW coast of Isla Isabel, shows a dramatic angular uncomformity between two generations of dipping tuff beds. The large volcanic bomb perched on the rim at the top lies on dipping tuff beds in the interior of the tuff cone. Wave erosion has left only the arcuate western rim of Islota Pelón, whose vent lies out of view to the right. 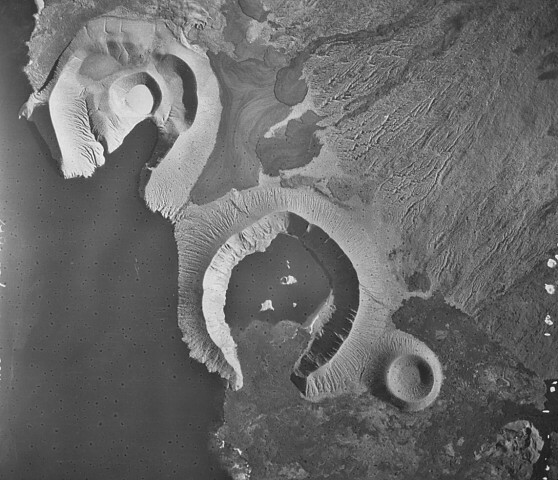 An aerial view from the SE shows the Bárcena tuff cone, constructed during an eruption in the Revillagigedo Islands off the western coast of México during 1952-53. 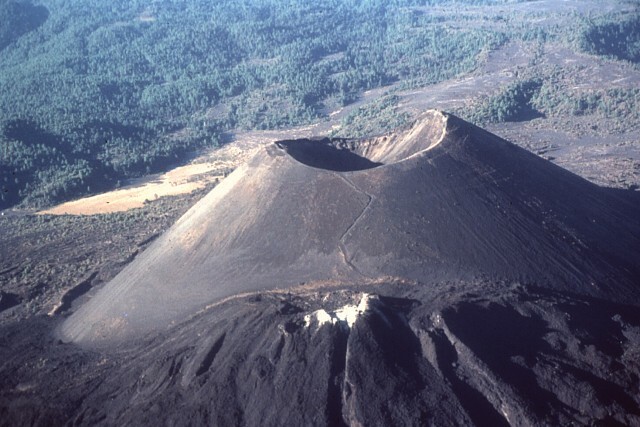 The 700-m-wide crater is partially filled by small lava domes, and a fissure on the flank of the cone fed the black lava delta at the lower right. The tuff cone was constructed to a height of about 330 m from near sea level within the first few weeks of an eruption that began on August 1. The first lava dome had formed by mid-September, and flank lava effusion began on December 8. Photo by Adrian Richards, 1955 (U.S. Navy Electronics Laboratory). 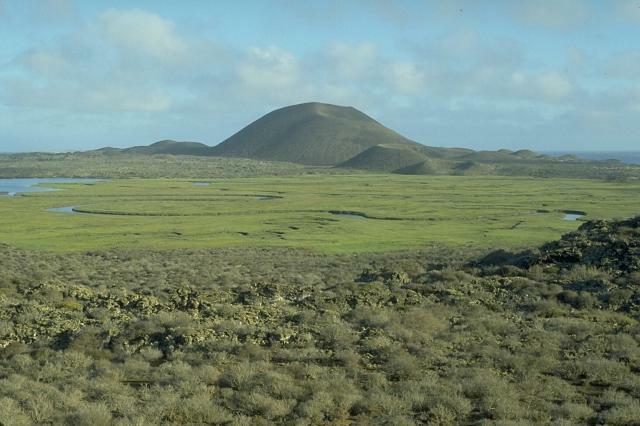 Cabo Cowan is a tuff cone at the NW tip of Santiago Island in the Galápagos Islands. 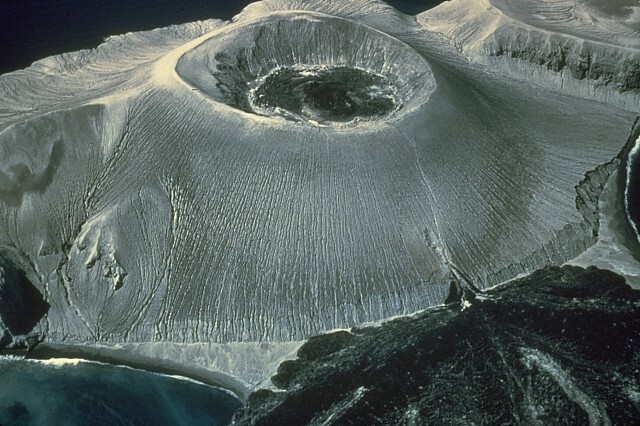 Its summit crater is breached to the SW, where wave erosion has truncated the flanks of the cone, forming vertical sea cliffs that expose its interior. 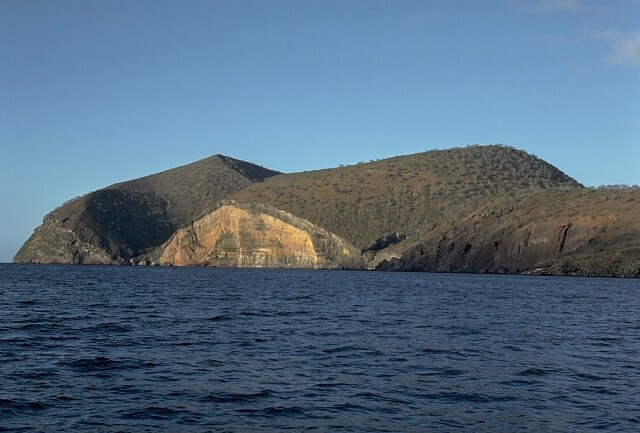 The 284-m-high tuff cone was constructed by submarine eruptions where the NW-trending rift zone along the crest of Santiago shield volcano encounters the sea.